There are two basic ways of selecting values for filters: drill-down and parallel selection. Ignoring the various modalities of the many derivative mechanisms for these primary modes of selection, the two basic ways of specifying a value for a filter essentially boil down to two choices: links and check boxes. A link is the simplest mode of filter selection. By clicking a link, a customer can either select a single value for a specific filter or drill down a level in a taxonomy, like a category or department hierarchy. 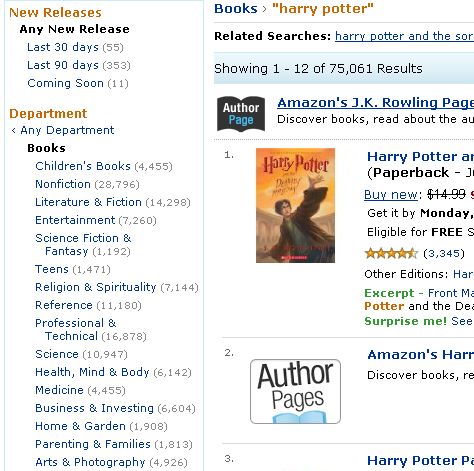 Amazon.com, shown in Figure 1, provides one of the best examples of a search results user interface that uses links to indicate filter value selections. Links usually indicate a straightforward equals condition—for example, I want to narrow my search results to Department = Books—as they do on Amazon. In contrast to links, which let customers indicate a single filter value, check boxes let customers indicate parallel selections of multiple filter values, limiting the scope of search results to those that match them. 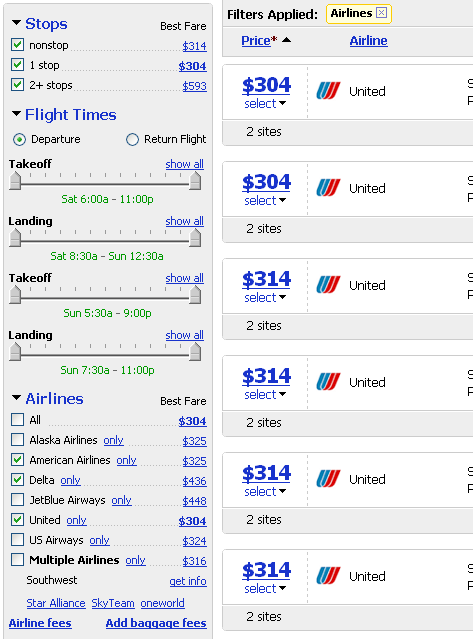 The Kayak.com search user interface, shown in Figure 2, uses check boxes to limit search results to specific airlines. As on Kayak, check boxes typically indicate an additive OR condition—for example, I want to narrow the search results to: Airline = American OR Delta OR United. Links and check boxes complement one another very well. Links are great where customers need to display multiple levels in a hierarchy—for example, multilevel category drill-downs. Check boxes are great for selecting one or more options for attributes like brands or sizes. Unfortunately, not all Web sites use these two value-selection paradigms correctly. Another confusing thing about the Office Depot user interface is that it does not provide any obvious way to deselect filters and return them to their original, pre-filtered state. This brings us to the next best practice: providing an obvious undo mechanism. Both Amazon and Kayak—pictured in Figures 1 and 2, respectively—provide a clear and consistent way to undo a filter value selection and go back to All or Any for a specific filter. For example, Amazon provides a link to Any Department. Notice that the link is offset to the left, and a less than (<) symbol helps customers understand that this particular link goes back. Under Airlines in Figure 2, you can see that Kayak solves the undo problem by letting customers click an All check box to view flights from all of the available airlines. Note that the Kayak undo is slightly less clear than that in the Amazon user interface, primarily because the All check box is neither highlighted in any way nor separated from the rest of the check box options. Instead Kayak highlights the airline that offers the best price. While not standard, this is hardly something that would cause undue confusion. On the other hand, the Office Depot user interface, shown in Figure 3, does not, at first glance, provide an obvious way of undoing the selection of the $50-$100 price filter. There is actually a mechanism that lets customers do this, but it is not at all obvious. The way for a customer to return to Any price is to deselect all filter selections. While this design may be completely valid from a computer’s standpoint, deselecting all check boxes does not effectively communicate the concept of All Prices to a person using the user interface. It would be much more effective to provide an All or Any option. 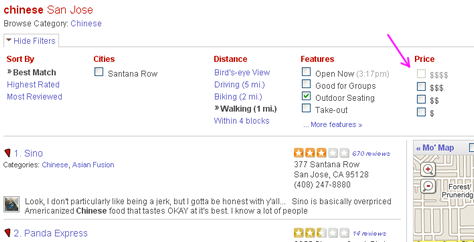 There are sites that use the deselect-to-undo paradigm successfully—one fine example is Yelp.com. However, sites that use deselect-to-undo typically take special steps to ensure consistency in the filter value options that do not change based on other filter selections. For example, instead of removing options, the Yelp user interface makes certain filter values unavailable to indicate lack of inventory availability. Items that are unavailable appear dimmed, as shown in Figure 4. However, in cases where consistency is difficult to achieve, it is a far safer option to use Any or All to undo filter selections, particularly when a filter’s value options are dynamic. As shown in Figure 5, when a user deselects filters out of sequence on the Office Depot site, even more confusion results. The Office Depot user interface is particularly sensitive to the order in which a user deselects the check boxes for a single filter. For example, the price filter option $50-$100 simply disappears if a user deselects it before deselecting the $50-$60 filter option. A customer would have to click the browser’s Back button twice to undo both selections, because there is no other way to return to the default state. Typically, all of the available filters and options, plus the data that appears on a page can change after each click. The key is to avoid completely removing options in the same filter where a click took place. If at different steps in the search workflow, filters start randomly disappearing from the search user interface with no way to bring them back, bad things start to happen very quickly. Please don’t misunderstand me. I am not saying all filters should be visible at the same time. It is perfectly acceptable to collapse filters to just a label, providing a single link like View All Filters, or to display previously selected filtering options in a unique way. However, if at different steps in the search workflow, filters start randomly disappearing from the search user interface with no way to bring them back, bad things start to happen very quickly. 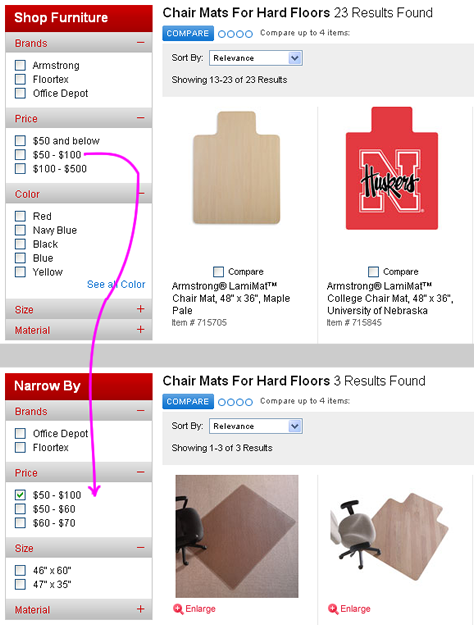 Figure 6 shows what happens to the Office Depot search results when a user selects the option Red in the Color filter. As you can see, once a user selects a color, all of the other filters disappear entirely. Does this system behavior make any sense? Let’s say I want to buy a red chair mat. Under Color, I can select the Red check box and view a great variety of red chair mats. Is there really a compelling reason for me to do anything else with the color filter? Will I, as a true connoisseur of all things red, perhaps drill down into shades of red for my chair mat, such as Burgundy, Farmhouse Red, or Ripe Tomato? Not very likely—at least not for chair mats. Instead, I am much more likely to say, okay, these are all of the red chair mats. Great! Now, can I select a mat from a known brand? Or perhaps I would like a budget-priced mat, so I need to further constrain my search by price. 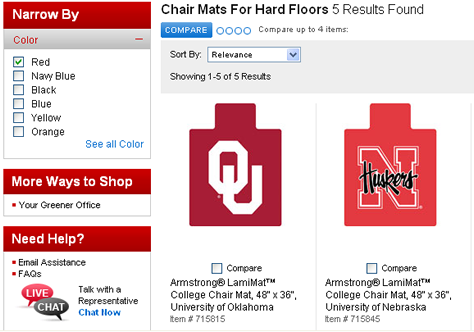 Or maybe I am a stupendous fan of the Ohio Buckeyes and want to find a chair mat with my team logo, leaving fans of the Michigan Wolverines green with envy. Using other filters to continue massaging my red chair mats query is a far more likely scenario. Unfortunately for both these use cases, when I selected a color, the Office Depot search user interface unhelpfully removed all other filters. This action would be tantamount to Kayak’s removing all other filters like departure and arrival times, number of stops, price, and class whenever a customer selected a particular airline. How helpful do you think that would be to someone trying to find a flight? Removing any filters completely can be detrimental to customer success and is, therefore, not recommended. If you really feel compelled, for some reason, to minimize the screen real estate you devote to filters, you can collapse individual filters or hide their options temporarily under a More Options link. At every step in the search workflow, any visible filtering options should reflect only the inventory that is available. I touched on the idea of showing only options and links that actually point someplace useful in my first UXmatters column, “Starting from Zero: Winning Strategies for No Search Results Pages.” At every step in the search workflow, any visible filtering options should reflect only the inventory that is available. This is dependent on a customer’s previous actions—both the keywords in the original query and the other filtering selections. As shown in Figure 7, the chair mat color selections expand to reveal tasty color choices like Maple Pale and Cherry Spice. Selecting Maple Pale and Red together should give us both red and Maple Pale chair mats. Unfortunately, the user interface does not seem capable of supplying Maple Pale chair mats, because, when the page reloads, it displays the same five red chair mats. We must always strive to design every filter to include a list of options that encompasses the entire available inventory. An equally important point is that we must always strive to design every filter to include a list of options that encompasses the entire available inventory. Let me give you an example. 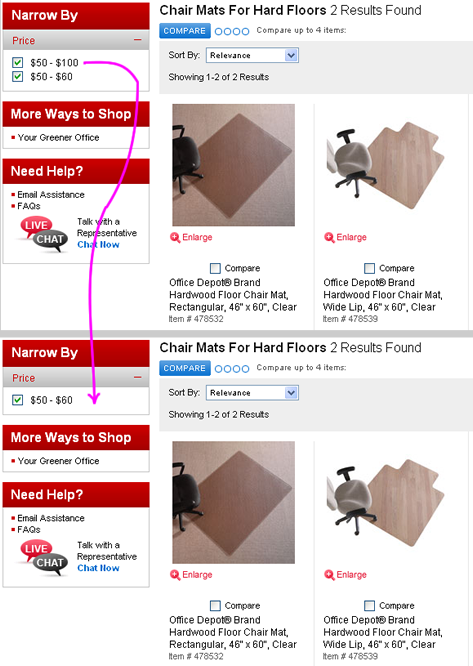 As you can see in Figure 7, the color filter in the Office Depot search user interface does not display the most common chair mat color, which is clear. Therefore, once a user clicks any of the color options, the site can display only a fraction of the available inventory—in this case, only 16 of 23 available items. The seven chair mats that are clear have no color attribute, so customers can never choose to view only those items using the Office Depot user interface. Instead, by specifying a color value, they unknowingly remove clear mats from consideration. This system behavior is clearly not beneficial to someone looking for a chair mat—especially if they are looking for the most common variety. I am not sure what Office Depot’s reason for omitting clear from their color options might be, but it is reasonable to assume that the clear chair mats have the color attribute of empty, or null. Therefore, it is not possible to group these items under a valid color filter attribute. Fortunately, one fairly straightforward way to resolve any missing or inconsistent data is to include Other or All Others as a filter option. The SQL condition corresponding to Other should specifically include any items for which the color field is empty, or null, enabling customers always to view the entire inventory by using some combination of the available filter selections. Often, there are more options for a given filter than you can show at once. Typically, best practice tells us to show 4 to 7 options for each of the filters. If there are too many options to display, it is often desirable to hide the rest of the options in a More Choices panel or popup. In this case, Other might be an option that shows up only once a customer is viewing the additional options. Specific queries dictate where to show each particular option. In our example, given the popularity of clear chair mats, I think Other should be at or very near the top. However, regardless of their order, it is critical to include all of the options that encompass the complete inventory. This is especially important in cases where there is no All or Any undo option—as in the Office Depot search user interface. Otherwise, we risk making some of the most popular items on a site unfindable. Faceted search user interfaces are fairly new, and potential design pitfalls abound. Fortunately, there are a few relatively simple and straightforward design best practices that should help designers to minimize cognitive friction and create search user interfaces that are easy to understand and use. In this column, I’ve presented five best practices for designing filters for faceted search results. Of these, I think the first—choosing either drill-down or parallel selection—is the most important. If you choose your filter value-selection paradigm correctly, you are already half way there. Whichever filtering paradigm you decide to implement, be sure to test your search results user interfaces thoroughly with both your potential and existing customers. I cannot overemphasize the importance of testing search user interfaces using realistic tasks. If your budget allows, it is best to avoid predefined search tasks. Instead, study how real people find items they are actually interested in—preferably in an environment where they would normally do the kind of searches you want to study. When designing search user interfaces, field studies are a crucial tool for continually making and validating design improvements—not just something you do as a formality at the end of a project. Thanks for this post. I’m glad to see more of these best practices discussions on search UX. As I commented in my own post a couple months ago, it has been a neglected topic for too long, but is now getting some good attention. The thing that I was hoping to see—and maybe I missed it—was inside searching versus outside searching, and when each is appropriate. When do users expect a search to be inside their current filters? When do users expect a search to be global and outside their current filters? Should a global search erase filters? If we can imply information about the user, should we set filters automatically? Should automatically set filters mean the search is global, but if the user sets filters specifically, the search should be inside? These are the difficult questions I’d like to see answered. YAY, Greg, and many thanks. Search technology has changed so dramatically over the last few years—an example being Nate’s product FAST ESP—and yet our appoarch to search interaction seems covered in rust from the past. 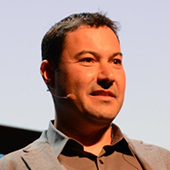 What has not changed are the behavioral issues that influence the user experience with search results. I plan to join the campaign more fully in a presentation this month. It is time for the information architecture and user experience communities to join with computer science in designing search systems that directly address the search ennui, search disorientation, and lack of discernment that are the outcomes of the present systems. Nate: Thank you for that example. I’m actually writing another piece on that exact topic—dynamic breadcrumb patterns—which should come out in a few months. I’d love to hear your thoughts on the subject. (The next Search Matters column will be on ads, co-written with Frank Guo.) Thank you! Eric: Definitely a hot topic, with no easy answers and lots of potential to get it wrong. I’ve tested many user interfaces that did not get it right—including one with three separate search boxes!! It was a truly spectacular failure. Again, the dynamic breadcrumb article I just mentioned should provide some interesting food for thought. In my experience, visual design can play a key role in users’ being able to reliably distinguish the “outside search” from the “inside search”. If you are on a project where this is an issue, my recommendation would be to create lots of visual design iterations, in full color, and test them with customers doing a RITE study. Make small tweaks to get it RITE. I will definitely cover this key topic in future columns and in the book I am currently writing on search and browse user interfaces. Thank you! Marianne: Many thanks for your post. Where are you presenting? I’d say I would be happy if even just designers and researchers would start talking a little more. :-) There are some companies that are working on new search user interface ideas. I will cover those more in my upcoming book and future column topics. Thank you all again. Please shoot me an email if you’d like to chat more: java_etc at yahoo dot com. A very interesting and informative post. You had great examples, displaying the differences in filtering. 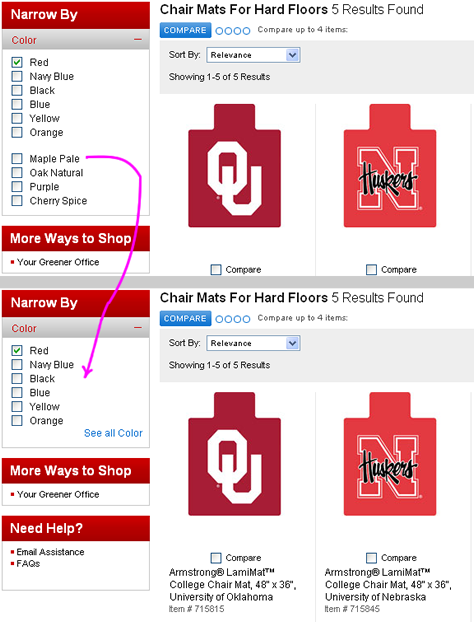 I, too, noticed that querying for ‘chair mats for hard floors’ in the search field resulted in less filter options—no color options at all. Why would that be? Hmmm. Not only that, but when the color options are available and more than one color is selected, the order or pattern of that filter option changes the placement of the check boxes and labels. Very confusing. Coming from the QA testing perspective, the development of search filters and consistency is absolutely essential to being able to test a business process with valid results. I was finding the check box labels’ changing positions to be disturbing, as well as the placement of the check boxes displaying differently in both IE and Firefox browsers. Thanks for bringing this topic up for discussion, because Ajax, as you mentioned, is really changing the ability to filter and unfilter with greater ease. This is a really good post, and I agree firmly with almost all of what you say—especially about price ranges, which I think should be more like Under $50 and so on. The one place I disagree is the question of showing facet values with no content. In some situations, it’s really important to show that the system knows about the possibility of a value, it just can’t find any that match. And now that I look at Office Depot, they can’t express this very well, because they aren’t giving facet match counts, so I don’t consider it a proper faceted search. If they had counts, they could have Maple Pale (0) or Maple Pale (backorders only), and add a lot to user understanding. Have you seen any UI testing done on facet clicks—in particular, on whether anyone ever clicks the undo options? It may be that, like advanced search, well under 1% of people ever use those. The Back button, on the other hand, is widely understood! Sorry to chime in late! Great discussion, and much in the spirit of the advice I give in my book on faceted search. In fact, the relevant chapter on front-end concerns (PDF) is available for free online. Based on experience, this can be addressed by good visual representation. You’d need to have an interface person who’s sensitive to such hierarchy of information and search actions. Great article!! I wonder if anyone has experience working with sorting of the facets. Does it impact the conversions/UX to show facets that get the most clicks at the top of the filter? How does the user usually get an overview of the facets? Would it help the user if the most clicked facets showed at the top? Great article. It’s several years old now, but the Office Depot search still removes $50 and below when you select the $50-$100 range.